Bringing your bike with you when you travel or go camping is more involved than taking your coolers. You need to make sure whatever bike rack you use is compatible with your bike and won’t damage your car, SUV or other vehicle in the process. Because not every bike rack is universal (and even some of those that claim to be are not) finding the right bike rack can be tricky. So we’ve done the research for you. Below are the best car bike racks on the market today. Some bike racks seem big enough to carry the space shuttle. Not the Allen Sports Deluxe Trunk Mounted Bike Rack however. It’s a lean, mean bike carrying machine that you can install by yourself in under a minute. And you won’t need any tools or a degree in engineering. It’s compatible with most models of SUV, sedan, hatchback or minivan. The heart of the Allen Bike Rack is the patented restraint system that consists of 5 individual tie downs. All you do is place the rack over the trunk, attach the two top restraints then the bottom restraint and then the two side restraint straps. Pull them all tight and you’re ready to go. The unit comes fully assembled with 4 generous foam pads to protect the car and the narrow set carry arms are designed to accommodate almost every size bike. Don’t forget to also bring your bike lock, so you can secure your bike wherever you go. The Thule T2 Pro XT 2 is the Audi of bike racks; a beautifully engineered, high performance example of what can be achieved when people put their minds to something. The only thing that prevents this from being our best choice is the price. 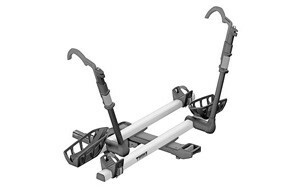 But if you don’t mind dropping more on your bike rack than you may have spent on your bike then the T2 Pro XT 2 Bike Rack should be on your shopping list. Your bike rides in regal splendor on a platform that extends out from the rear of your car. The rack itself never comes in contact with your vehicle’s paint job nor does it do a grab and scratch on your bike frame. Emphasis instead is on restraining the bike by way of the wheels. The T2 can accommodate up to 4 bikes (depending on size) with a total load capacity of an amazing 120 pounds. Easy to install and easy to use. Make sure you also check our guide to the best roof racks. 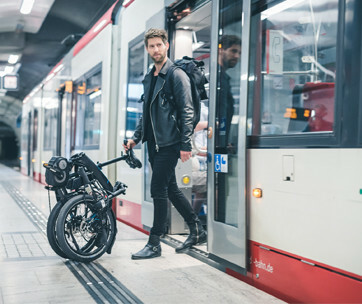 Critical Cycles approaches the problem of how to safely and effectively transport your bike without damaging it or your vehicle in a novel way. Their solution is to repurpose your trailer hitch as the host for the Lenox Hitch Mount Bike Rack. It’s the type of outside the box thinking we love to see and the results speak for themselves. The Lenox attaches in about 10 minutes to any class III or IV trailer hitch receiver. The whole thing weighs less than 25 pounds but can hold a formidable 140 pounds. The high grade steel components are engineered to exacting tolerances so there’s no jangling around and the rack tilts outward to allow you access to the back of your vehicle. Holds up to 4 bicycles on the twin armed rack. Prepare your camping tent and hit the road! Like the Allen Sports Bike Rack profiled above the Saris Bones 801 3-Bike Trunk Mounted Rack sets up in about a minute using a series of restraining straps. Unlike the Allen Sports Rack the Saris Bones 801 pivots in the center. This allows it to more easily adapt to SUVs and other vehicles with more or less flat backs. The 801 features injection molded legs fashioned from 100% recycled material, a stunning arched design that’s a futuristic as it is practical and the ability to carry 3 bikes. Once the restraining straps are tightened down the 801 stays put and so do your bikes. The Saris is available in a variety of colors to match your car and weighs a scant 11 pounds. This also makes a perfect gift for mountain bikers. The Thule UpRide Universal Bike Rack is an ingenious, lightweight roof rack for your bicycle that sets up in minutes and is a safe for your car as it is for your bike. It will accommodate most 20-29” wheel bikes with tires as much as 3 inches in diameter. This is a universal bike rack in the sense that it will work with nearly every type of private vehicle from sedans to SUVs to hybrids. The bicycle restraint system doesn’t contact the beautiful paint job on your frame but instead grabs secure hold of the wheels, twice in front and once in the back. The icing on the cake is the built in cable bike lock that makes sure that if you need to stop into the store that your bike is still there when you come out. No one is going to call the Swagman Upright Roof Mount Bike Rack elegant. But they will call it other things like effective, lightweight, affordable and innovative. The Swagman can be used with Yakima, OEM and Thule roof bars up to 3 inches wide. Unlike some racks that weigh 50 pounds and more the Swagman tips the scales at a svelte 5 pounds and costs less than a pair of jeans. The concept is extremely simple with a single track running the length of the bike. The wheels sit in this track and are strapped down firmly. The main restraint element is a U-shaped metal tube with a clamp at the top that grabs your bike by the downtube and holds it fast while it rides atop your car. Don’t forget to also check our top car wax review, to treat your car. The Hollywood Racks Express Trunk Mounted Bike Rack adjusts to the curves of the back of your car and is held in place with a set of adjustable restraining straps. It has generously sized foam pads to protect your car’s paint job, equally gentle bike cradles that leave your bike paint job unscathed and 4 adjustable straps to secure the rack to your trunk. This model has a load capacity of 35 pounds and can accommodate 2 bikes in stable comfort. The Express will leave your bike, your car and your bank account intact and provide you years of reliable service. Our guide to the best rooftop cargo boxes offers more great products like this so check it out. The Tyger Auto Deluxe 1 Bike Trunk Mount is compatible with the full range of domestic vehicles and sets up in about a minute. It does a better job than most adapting to the more or less vertical tail end of the SUV but doesn’t shy away from other vehicles styles either. The Tyger is lightweight, rust resistant won’t scratch your paint job and can be tucked away in the car after you remove the bike. Everything from the 4 restraining straps to the bike cradles are simple and strong and the rack comes with a limited lifetime warranty from the manufacturer. The Bell Cantilevered Trunk Bike Rack is engineered to fit a wide variety of trunk styles and sizes and also to attach with rock solid certainty to the back of your SUV or hatchback. The Bell Trunk Rack is lightweight, easy to deploy and, like several other racks on this list, is secured by way of adjustable restraining straps. The Bell Trunk Rack bike cradles are firm yet gentle on your bike and keep the bikes effectively separated. The cantilever allows for quick, sure adjustment of the bike rack angle and the durable foam pads mean your car is never in danger of scratches or dents. Following are some of the things we looked at when selecting car bike racks for this list. Brand - While the brand alone is not always indicative of quality companies that have been making racks for decades likely have pretty good idea what they’re doing. That said there are so many young talented designers, engineers and startup owners out there today that we don’t close the door on any potential source of a good quality rack. Reviews - The Internet is a teeming hive of opinions with everyone tossing in their two cents about this product or that. While a diversity of opinions is always a good thing the fact is that it’s simply not wise to give too much weight to customer reviews. Simply because you don’t know the source. So we’ll read what people have to say, take their points under advisement and then check out the product ourselves and make our own determination. Quality - Many of us here have bike racks and have been through the car bike rack selection process. It it’s taught us anything it’s that a car bike rack that might look just fine from a distance may not stand up to close inspection. We look at welds, clamps, foam padding, the strength of the steel tubing used, the quality of the plastics and the quality of the restraining straps. We look at the clips that attach those straps to the trunk or bumper and we look at how the bike sits in the rack both by itself and when there are multiple bikes on it. All of these things and more are indicators of quality. Price - We’re big believers in value. If a thousand dollar rack is great but there’s one 1/10th the price that is nearly as good, it’s a far better value and we’ll take that every time. However, sometimes you very much get what you pay for which means that sometimes that really expensive rack is just head and shoulders above the competition. Does it protect your vehicle? - The litmus test of any bike rack is whether or not any of its component parts scratch or otherwise damage your vehicle while you travel. If it does or it seems upon inspection of the rack that it might, you should take a pass. Does it protect your bike? - Just as important as protecting your car is protecting your bike and its paint job. If the clamps holding the bike actually embrace elements of the frame those clamps need to be lined with a soft material that has no chance of scratching your bike. If the clamps are not made of a scratch proof material you should look for another rack. Weight - Most every trunk mounted rack has foam padding to protect the paint job on your car. But if the rack itself is too heavy you run the risk of putting a discrete (or not so discrete) dent in your trunk when the rack is fully loaded with bikes. So the lighter the rack the better for trunk mounted units. Adaptability - Not all racks will fit all passenger vehicles. We, however, are partial to ones that will fit as many as is practically possible. Even something as seemingly specialized as the Lenox Hitch Mount Bike Rack will fit any type of car that has a class III or IV trailer hitch. So it’s actually quite adaptable. Overall construction - The rack needs to be well engineered, well-built and able to stand up to the elements. Cheap metals, plastic where there should be metal and less than spectacular foam padding to protect the car are all things you should look at. As are the quality of any welds, the quality of any restraining straps and whether the adjustment mechanism is smooth or clumsy. How much it costs - If money is no object for you that’s great. Most of us mortals though don’t have a grand to drop on a bike rack. While that thousand dollar rack may be the gold standard chances are there’s a $50 or $60 rack somewhere that will do nearly as good a job. 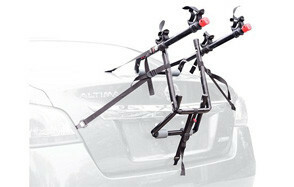 Trunk mounted racks - These are the most popular type of car bike rack sold today and for a number of very good reasons. They’re affordable, they can be installed and removed very quickly and you don’t have to worry about getting your bike up and down from the roof: a practice that has led to innumerable scratched paint jobs. Trunk mounted bike racks can be stored away in the house or in the trunk until you need them and they typically come pre-assembled and ready to go. The only real potential downside of this type of rack is that the bikes may block your rear view mirror or get stolen if you don’t use a bike lock. Roof mounted bike racks - Most roof mounted car bike racks attach to the crossbars that either came with your car or which you installed to carry your surfboard or whatever. Some come pre-assembled while others require some work. The roof mounted bike rack has the advantage of keeping your rear window clear so you can see what’s behind you when you’re driving. Some also have a bike lock. You won’t have to remove you bike seats either because you fear they might get nabbed while you’re in the store. At the same time, as we mentioned, getting your bike up and down from the roof can be a perilous endeavor unless you are tall and in great shape. Hitch mounted bike racks - The hitch mounted bike rack is a relatively new invention. It makes use of your existing trailer hitch and repurposes it as a bike rack That is, it plugs directly into the receiving end of your trailer hitch and uses it to create a stable platform for storing your bikes. 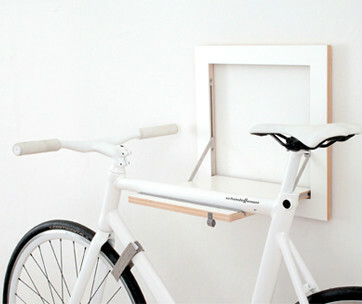 This type of rack is very sturdy and can typically hold 140 or more pounds of bicycle without breaking a sweat. 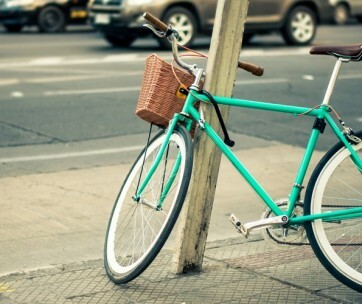 It also keeps your bikes well away from the car so there is no chance of accidentally scratching the paint job. The hitch rack also leans back out of the way to allow you access to the trunk or the back of your SUV. 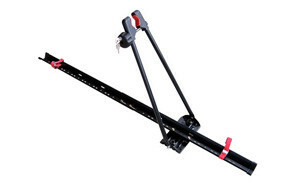 Most hitch bike racks will fit into any class III or class IV trailer hitch. Truck bed racks - These are not as popular as some of the best car bike racks but only because fewer people own pickups and most of the ones that do use them for work. Still the truck bed bike rack can come in handy, particularly when you want to transport several bikes. They sit up toward the front of the truck bed so the bikes enjoy the added safety of being on the rack and in the bed of the truck at the same time.